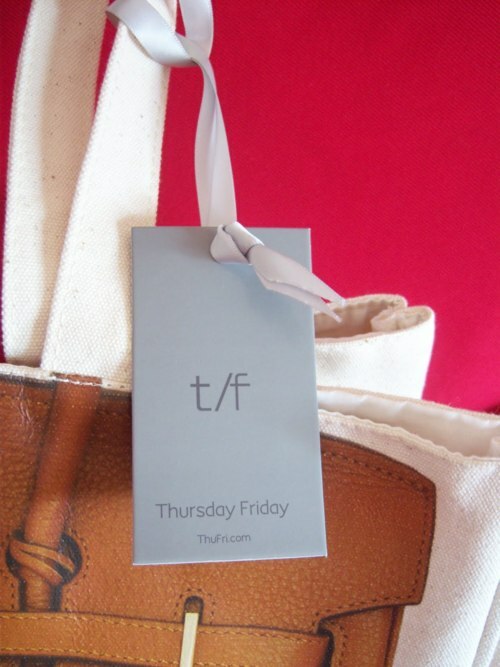 Shame Shame Shame, which are the 3 magical little words Hermes and every fashion girl around the world is saying when speaking of the Thursday Friday Birkin Canvas bag. However, this “shame” talk can only lead to one thing…FAME. Who would have thought that the borderline counterfeit bag (which is not classified a true Firkin ) would have become not just a trend on twitter, but a trend in that of itself. At $45, its a Birkin Steal, which is what people are doing, Thursday Friday is back ordered till June. It has been said that the ever elusive Hermes Birkin Bag has a 2-4 year waiting list, after all their handcrafted chic-ness does range from $9,800-$220,000. So when this little canvas bag came along with the printed high gloss image of a the same bag, there was no doubt it would be a hit, in fact Thursday Friday’s creation of theBirkin has manifested its own 4-6 month waiting list. what makes this bag even more fab is that not only does it start, but it stays at a mere $45. The New L.A. based label Thursday Friday is creating such a buzz around their it product, which goes by the name of the Together Bag, that celebs are even trading in their own Birkin all “Together” for one. The image behind The Together Bag is really the image it has printed on the bag itself. The juxtaposition between the high-end image and the low-end fabrication is the genius of the product. The brikin bag has been known for one way and now being used and seen, in a completely and not to mention contemporary way. This bag, as popular as it has become, is as well getting its bad press. 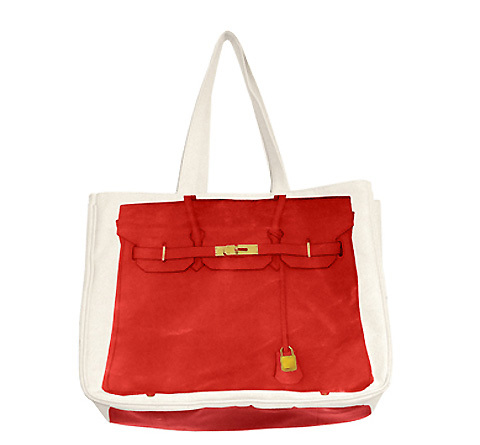 Hermes, the Maker of the iconic Birkin bag, are not so into it. Which brings me to mention and revisit the issue of a past icon. Campbell Soup Vs. are very own Andy Warhol, which Warhol’s creation or rather reinterpretation of an American classic brought the brand into the pop art and pop culture world. Art versus style, which to many fashion is equally as art-full as any art forum, Which is funny in this case (and i do mean legal case) given that these two brands are going for each others throat with this image. Could this be are new ART? as to say, the new POP ART icon,”fashion itself”? Has the image of the Birkin bag out weighted that of the Campbell Soup Can? The image of the Birkin has become the image of status and power of the ultra elite, and now, those women, that are not so much ultra elite but oh so fab are walking around depicting the image of theBirkin Bag rather than aspiring to purchase the actual one. some would say all this is, Blasphemous and Shameful in the eyes of Hermes. All this talk of the battle in the courtrooms; hasn’t the Hermes higher ups ever herd the term,” Imitation is the most sincere form of flattery.” well not so much imitation as opposed to mockery! Thursday Friday, and their famous, well infamous Together Bag is standing to be such a hit on another level due in part, of the message Thursday Friday is conveying, Anti-Fashion, ironically, anti-fashion is one of the most timeless trends in, well, “Fashion”. The idea of using the image of an icon, and turning that same image to contradict itself is the true success of this bag, and the true issue. Women are starting to see the humor in this bag, why carry something that to most is becoming a narcissistic form of success and wear the image on a canvas to say, “hell i make my own success”! It’s brilliant. The girls at Thursday Friday should be oh so proud, given that i have already pre-ordered it in Red, but am forced to wait till June to finally be put on the list to receive it, because the “IT” girls beat me to it!! Whats next for Thursday Friday, who knows, what we do know is that they are rattling the tale feathers of fashion houses and making their way into our houses, in a very humors way! We are loving every moment of this, and really those women and girls everywhere wouldn’t be caught dead looking shameful, so that must mean that The Together Bag, has turned shame into the new fame!